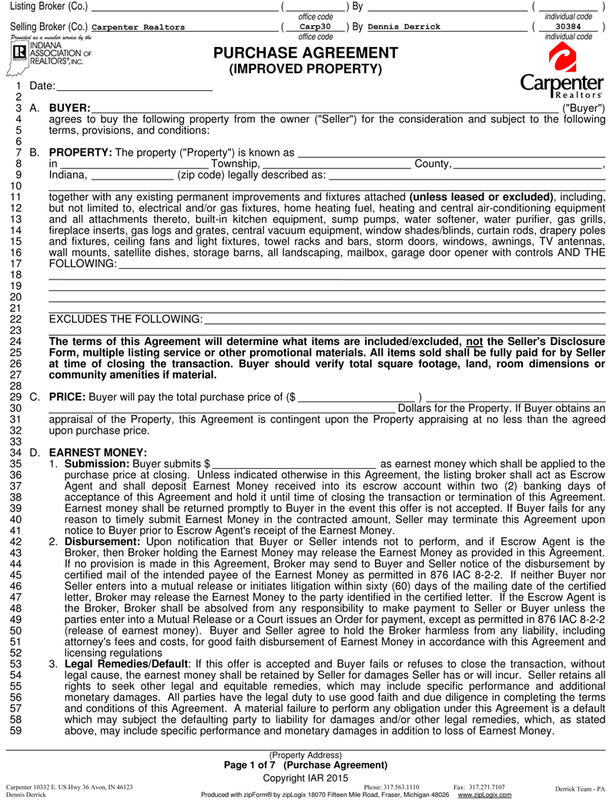 Every state has different rules in regards to real estate transactions so in this article I’m focusing on Indiana’s Residential Purchase Agreement and the contingencies that matter most to buyers (but really are important for sellers to be aware of as well). Today’s purchase agreement is now more helpful to the buyers than in the past. Years ago purchasing real estate was more of a ‘buyers beware’ transaction as most of the contract favored the sellers. Any misstep by the buyers and they forfeited their earnest money to the seller or listing broker. Now there a few built-in contingencies that unless superseded by other documents help to protect the buyer. The 2 most important on a standard contract is the ‘Independent Inspection’ section and the ‘Financing’ section. Any good real estate agent is going to instruct their buyer to plan on the inspection costs as that is one of the best protections a buyer has. The idea is that they don’t want to end up paying too much for a home that has hidden defects (or at least not obvious to the untrained eye). When purchasing a home, a buyer needs to understand that they are paying for an inspection because the inspector is working for you, not the seller. The inspection section in the Purchase Agreement gives the buyer a time period to have the home inspected for major defects and safety concerns and determine if they want them addressed by the seller. It’s what we refer to as another ‘buyer / seller negotiation’ process in the transaction. The buyer can ask that certain items be repaired or addressed and the seller can negotiate back. A good listing agent will have prepared the sellers for this part of the transaction so the seller should be prepared to address any major defects found by the inspection. In rare cases the buyer can determine the house is in such bad shape they can ask to cancel the Purchase Agreement with a mutual release and have their earnest money refunded. Our experience is if both sides are reasonable this can be worked out to both parties satisfaction. Keep in mind if a buyer waives the right to inspection, you’re back to ‘buyer beware’. The other important section is the financing sections that outline the type of buyers financing and the timeline in which everything is completed up to the final ‘closing date’. For the most part this protects the buyer so that if for any reason the buyer cannot obtain financing to complete the transaction the buyer will get a full refund of the earnest money. For the buyers sake it’s always a good idea to have all your financing worked out before you start looking at homes. When we work with buyers we insist a buyer talk to a lender to confirm their financial status before we start showing homes. We don’t want to waste everyone’s time if there was never any chance the deal would close. But at the same time there can be other reasons for the buyer to not be able to get financing. In some cases it might be the home’s condition is so poor the lender denies the loan (usually FHA / VA loans). In other cases it can be the appraisal comes in too low and the seller is unwilling to lower the price so the buyer is unable to get the loan. And in some cases there are sudden financial hardships that come into play as the buyer loses their job. So in most of these cases the purchase agreement protects the buyer in that they at least should get their earnest money back. Keep in mind there are other factors that come in to play but this is mostly what we have seen in our past experiences. There are a handful of other sections that give the buyer a chance to negotiate or back out such as if the transaction is dependent on the buyer closing on their current home (and that buyer fails to close) or the section that covers homeowner associations. But the inspection and financing are what we always see as the 2 most important when working from accepted offer to closing. So a buyer must pay attention to this and work closely with their agent and lender to make sure everything goes smoothly to get to the point of signing the closing documents and getting the keys to their new home. Have questions on how the process all works? We do free one on one buyer consultations. Check out the details here, 0r feel free to call or text The Derrick Team at 317-563-1110. Based out of Avon Indiana we serve Hendricks County and the surrounding Indianapolis Metropolitan area. Dreaming Of Buying Some Land? Part of the American Dream is to own that place out of the city with maybe a few acres, a pond or lake, and plenty of space for horses. This was something I wanted back when I was younger and hoped to have some day. It’s still a popular dream as any of our listings with a few acres gets a lot of inquiries. But it sounds really great until you actually try to purchase your Land Dream Home. For this blog post we are focusing on raw land, as that is what we receive so many questions on what a person needs to do to make an offer. Usually the conversation starts with “We want to make an offer, what do we need to do?” The caller is excited and doesn’t want to lose out on the opportunity to buy the first part of their Land Dream Home. But then it gets a little more complicated. As in all purchases the ‘how you pay for it’ comes into play here. Unlike what is referred to as ‘developed land’, meaning land with a home built on it; it can be difficult to get a lender to finance ‘undeveloped land’ or raw land. Land with a home on it is much easier to place a monetary value on thus the appraisal can give a clear value on how much money can be loaned to the buyer. Raw land on the other hand often has potential value based on its possible use. Agricultural land can be used as collateral for a farm loan but the value is based on possible future crop production. Commercial land can also be valued based on future income possibilities. But with residential the value can vary greatly based on what it’s used for and what is eventually built on it. So lenders tend to stay away from loans for raw land. The only exception is the situation where the buyer is ready to build a home. This is a type of bridge loan where the lender approves a loan based on the land value and the home to be built on it. These typically are limited to 18 to 24 months while the home is constructed. The loan is then converted to a standard mortgage once the home is completed. So the best way to approach this option is to pick out the builder and type of home you want to build and find the land to build on. If you won’t be ready to build for a few years this probably will not work for you. Another option is to buy on contract. In this case the seller has to be willing to be the lender for a set period of time, usually limited to a few years. The buyer agrees per a ‘land contract’ to put a certain percentage down, usually 20-25% and make monthly payments like a normal loan. Typically these are limited to 2 – 4 years and at the end of the term the buyer must pay the remaining balance or forfeit the land back to the seller. Interest rates are usually higher than general rates at the time. So as you can see this type of loan strongly favors the seller for taking all the risk as they may end up having to put the land back on the market. This is not necessarily the best approach to start with your Land Dream Home. So how does one actually buy raw land? One word: Cash. In any purchase cash is king but in this case it really is the only viable option. So we recommend that if you want to buy raw land to start the process for your Land Dream Home, start saving now to purchase in a few years. There may be other options for you to get cash such as borrowing against retirement accounts but that would be a discussion with your financial planner, not something we Realtors can advise you on. Then there are always rich relatives but again that’s outside of our advice window. So to summarize you have 2 viable options. If you are ready to build hire a builder and work with a lender on a construction loan. Or pay with cash. 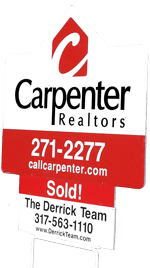 If you have any further questions or need help in locating the perfect land for your Land Dream Home give The Derrick Team a call today at 317-563-1110. Even if you are a few years out from having enough cash, feel free to contact us. We’ll help you down that long road to your Land Dream Home. 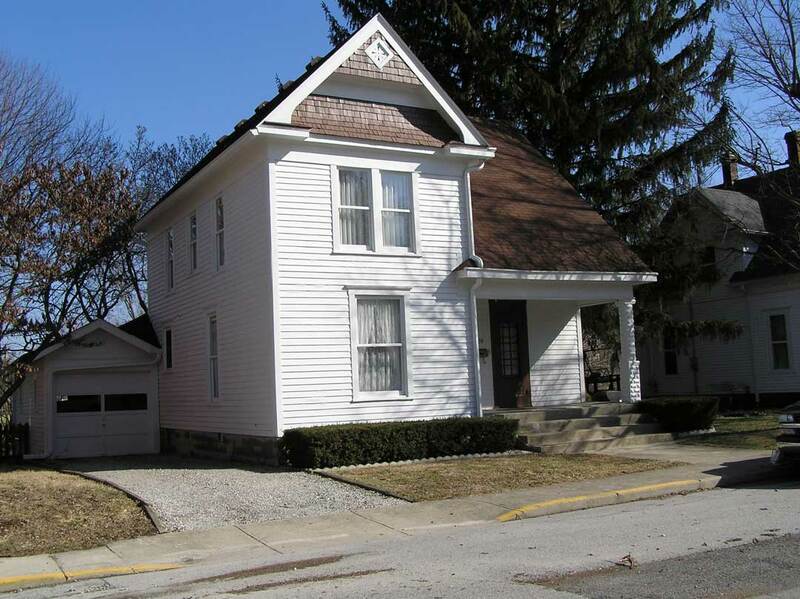 You can find some land search links at our web site http://IndianaAcres.com. 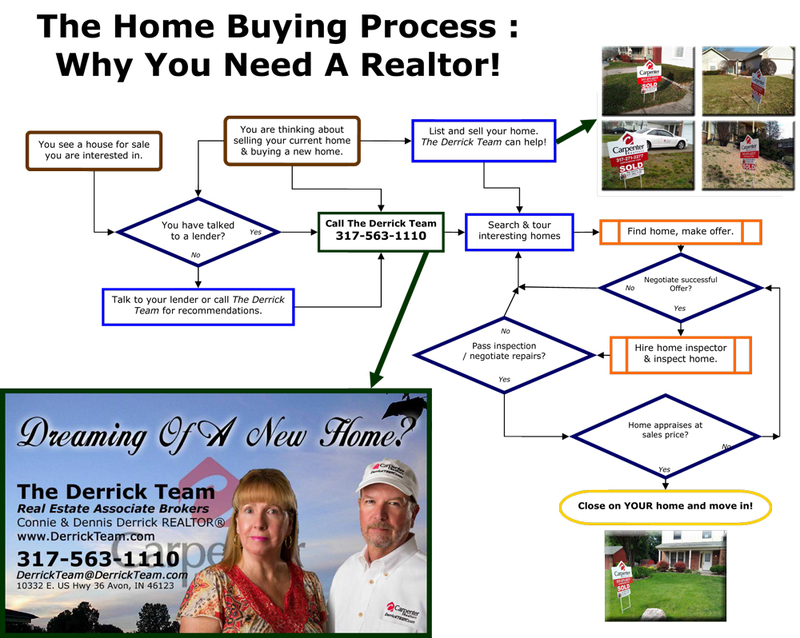 Home Buying Flowchart: Why You Need A Realtor! Deciding to own a home is an important decision that people shouldn’t take lightly. It’s a large financial investment of both time and money. But it’s a good one for those who have settled down roots in a community they want to live in for the next few years at least. 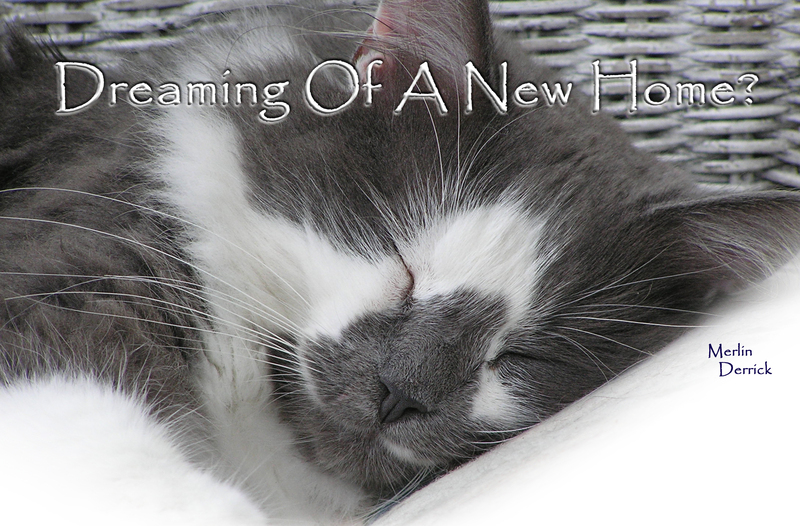 Or maybe you’ve outgrown your current home with an expanding family. Whatever the reason this chart outlines the typical processes involved with buying a home. This should really be a part of your decision process in the beginning for several reasons. Most importantly you need to know if and what you can qualify for. You may find some unknown issue with your credit that needs to be fixed first. Or you may find you can buy a more expensive home than you originally thought. But no matter if you are buying your first home or selling and buying another, you need to know your financial position first. If you don’t know of any lenders give The Derrick Team a call and we can recommend one. Now you know your financial situation you’re ready to tour some possible homes. Don’t make the mistake of going it alone as you really can save a lot of time using a realtor to help you. And it comes as no cost to you as the seller pays the fees. Call The Derrick Team and we’ll sit down and go over the processes and determine how to start your search for your new home. This can be a long process or can happen real quickly. It just depends on what you are looking for and what’s on the market at the moment. We can really help you narrow down the choices and point out the items to focus on with your particular needs. We will set up an automatic search that sends you properties as they come on the market so you can be the first to have a chance to make an offer on that perfect home. We also can quickly get you information on any home you happen to see on your own. There is no reason to not have a realtor help you with your search. Once we find the home you want we will go over your options working closely with your lender to put together an offer that tempts the seller to accept immediately. We pride ourselves in writing ‘clean offers’ that often result in our clients winning over other offers submitted at the same time. We work closely with you every step of the way in the negotiations during the offer process. Once you have an accepted offer the first step for you is to hire an inspector. While you don’t have to do this step we always recommend it based on our experiences in hidden problems with homes. We can recommend inspectors and Dennis will do everything possible to be with you during the entire inspection to answer any questions you have. We work with you every step of the inspection process and if needed, negotiated repairs. If for some reason seller is unwilling or unable to make repairs you then have the option to go back to searching for homes again. The home appraisal is another point that can become an issue if the property does not appraise for the sale price. While this is usually the seller’s issue we will work with your lender and the seller to negotiate a new sales price if needed for you to get the loan. If for some reason seller is unwilling or unable to adjust the price you then have the option to pay the difference or go back to searching for homes again. After making it through all the contingencies in the steps to buy a home we now have the last step with the actual closing where you take ownership of the property. We will be there at the closing to assist you in this step as well. The only thing left after this for you to move in! As you can see this process can be very complicated (and this is a very simplified description of the actual process). Having a realtor on your side each step of the process is something every buyer should have right from the beginning. With The Derrick Team you have 2 agents there to help every step of the way. Call or text us today at 317-563-1110, 7 days a week. Your realtors are here to help! Or use this handy Contact Form! Download our Buying A Home book for free! Ready To Buy A Home? You Might Consider A Financial Diet First. We always suggest any homebuyers check with a lender before getting started on your search for a home. There are many reasons for this but the most important is knowing where you stand in what you can afford and what options you might have available to you. You might find you’re not in a position to buy in the area you want or maybe you can actually afford more. For example if you are looking for a fixer upper you need to know about 203K repair loans and if you qualify. There are so many options you just need to find out what works best for you. If you want to be ahead of the game you need to gather all the info the lender will ask you and review it yourself first. The usual rule is 2 last paychecks, 2 months of bank statements, and last 2 yearly tax returns (signed). Now consider what other bills you owe such as car payments, credit cards, and any other ongoing payments for more than a few months as they will show up in the credit check by the lender. Add these all up and then you might see the need for a ‘financial diet’. So where do you start? First examine the short term debts such as credit cards and revolving accounts that have a balance that could be paid down. Also look at things like car payments, especially if you are in the last year of the loan. Now figure out where you can diet (items you can do without i.e. financial ice cream). 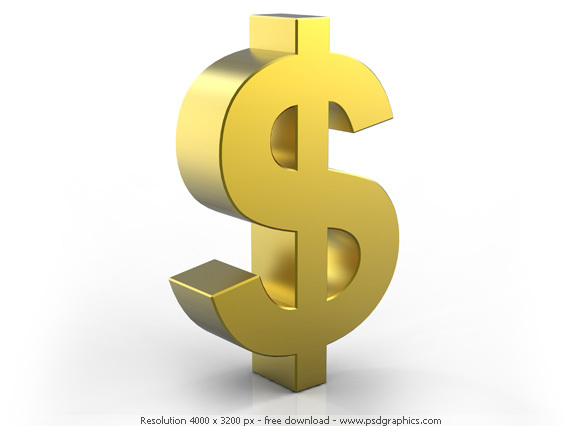 Take that money and pay down or off any bills you can to get yourself in better financial shape. Why is this important? First you want make sure you are ready for the financial responsibility it takes to own a home. But more importantly it helps you qualify for a better rate and possibly save you thousands of dollars on your home mortgage over the life of the loan. So buckle down and stop eating out all the time. You’ll find you get in both better financial and physical shape with proper dieting. Call The Derrick Team with any questions when considering a home purchase. We’ll be happy to help you even when you are starting your ‘financial diet’. We can help guide you months, even years in advance of your next home purchase! Call or text today at 317-563-1110 or use our handy Contact Page. Are You Thinking Of Selling Your Home? Read This First! Let’s start with why. Sometimes it’s obvious, such as you’ve been transferred to a new city. Or maybe family situations have changed such as a divorce, death, or recent medical conditions. Maybe you’ve found your house is too expensive or large and you have to downsize. If any of these are the case or you just know you have to move the next section won’t apply but read it anyway as it might open your eyes to a potential problem. Now maybe you’re just considering a move, but don’t have a specific reason that you have to sell your home. There is a little more to consider. First, determine where you want to move to. Do a little research and look for an area that interests you. Check home prices (your Realtor can help, you do know one now), and visit Open Houses when you see them in the target area. Talk to friends that live in the area. Once you have an idea, now make sure you can afford to live there. This is a step sellers often forget to do, no matter what the reason to sell is, make sure you can buy another home! Check with your bank or lender and get prequalified. Just because you own one now doesn’t guarantee you can buy another. Job changes, credit problems, other debt load, can easily disqualify you from a new mortgage. They will prequalify you based on the sale of your current home. A CMA can help here so have your Realtor do one for you. None of this obligates you to sell your home, it’s just a good homework assignment before moving to the next step. The next part is evaluating the readiness of your home for selling it for the best return on your investment. In other words it needs to look move-in-ready to help you get the best sales price possible in this highly competitive market. At a basic level you need to think of fresh paint, replacing worn flooring, installing new fixtures in kitchens & bathrooms if they are stained or extremely outdated. Again your Realtor (the one you now know) can assist you in what helps the best in your area and price range. You don’t want to spend too much and not get that much back, so don’t get too carried away. See more about preparations in the post. Now you are ready to put it on the market, right? No not quite yet. Prepare yourself for your life being interrupted for showings and open houses. Start packing what you don’t need and make your home look inviting but not too personalized. Start making plans for your move. Don’t be caught off guard when an offer comes in. We’ve sold homes in days before (once a more common thing than today), and our seller had to scramble to find a place to live. So you don’t have to rush to buy a home if that happens, accept the fact you may have to move into temporary housing, nobody wants to rush a home buying decision. If you are ready to sell, or will be soon, call that Realtor you know today. That would be The Derrick Team at 317-563-1110. We’re here to help for all your real estate needs! FHA Guidelines – Does your home pass the test? Getting ready to put your home on the market? You might want to check out the requirements an appraiser will need to OK your home for an FHA loan. Why is this important? A large portion of homes are sold with the buyers getting some sort of FHA financing, or requires the home to pass FHA appraisals. If your home doesn’t pass that test, your limited to conventional or insured conventional loans, or cash buyers. That shrinks your buyers market, considerably…..! In general this all sounds good as any buyer wants their property to be a good investment as it’s a rather substantial one for most buyers. But as a seller you can easily get tripped up on the sale process after a buyer has made an offer. You’ve negotiated a sale price that you feel comfortable with, and then the appraiser calls out many defective items that will need to be addressed in order for the FHA loan to be given to the buyer. Now your stuck with paying for the repairs, or letting the buyer walk away. And you’ll have to make those repairs before the next FHA buyer comes along. We’ve seen this happen more than once…. Peeling paint, especially on older homes (pre 1978) that might contain lead based paint. Roofs that have outlived their life (a judgment call sometimes, others more obvious). Exposed wiring or dangerous electrical issues. Loose or missing handrails and balusters. Holes in walls and flooring, especially as pertains to firewalls (between garage and home, or other units in multi unit buildings). This is a very short list but it covers some of the items we’ve seen called out, more than once. Appraisers are required to go by the FHA guidelines or they can be fined and lose their license. Some will be more strict than others and sometimes you can request a second one at your own expense. But that doesn’t guarantee anything, so the best approach is to address obvious items up front, and be prepared for some surprises, even on newer homes. Or just give The Derrick Team a call. We’ll be glad to come do a walk through and help point out the obvious items we’ve seen called out. Some items can only be determined by a professional (electrician, HVAC tech, etc). But we can at least give you a heads up. Call us at 317-563-1110 today! So you are starting to think about buying a home. Here are the basics to get you stated. Look at your current income, bills, savings, etc, and organize this into something you can easily reference. If you are handy with a spreadsheet this is the best way to get everything in one place. What you want in the end is an accurate document of your current budget. The best place to start may be where you bank. But be aware that not all lenders are the same. They all have different options for loans; some have more for first time homebuyers, others for low interest rates for people with outstanding credit ratings. So don’t get discouraged if a lender acts like they cannot help you. Another one may have the perfect plan for you. Your REALTOR can help you find one too which leads to the next step. Actually you find one to represent you. We are paid buy the seller with the home you ultimately purchase. But we still represent you and you only so you are really hiring us to help you. Most agents will ask you sign a Buyers Agency form that formalizes that we represent you in real estate transactions. Once you choose one, use them exclusively because if you jump around from one to another, none of them will be that interested in really helping you. So remember, loyalty is important! 4. Start looking for your new home. Now you have your team assembled with your lender and REALTOR working together with you so now you can start looking for you new home! Your REALTOR will talk with you on your needs and desires and help you in your search. Then when you’ve got a list of possible homes, they will take you to see them, pointing out items of interest in each home based on previous discussions. When you find that perfect home, they’ll guide and represent you in negotiations with the seller. They’ll be there to work with you on the inspection, providing lender information on the home, all the way to the completed purchase (known as the closing). 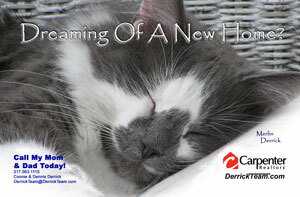 For more information call The Derrick Team today at 317.563.1110, even if you are still at step 1! You’ve talked to a lender and now know what your price range is for purchasing a home. You’re working with a REALTOR to find that ‘just right’ home you’ve always wanted. While your doing the search, and especially when you’ve found one and made an offer, there are very important steps to make sure you still qualify at the closing (purchase) of the home. You absolutely should not take out any additional credit or even have an inquiry into your credit report from the time you start the loan application until after you have completed the purchase (closing is when you sign all the documents and make it official). Go on a spending spree for new furniture, new window treatments, etc., and raise your credit balance above 30% of your limit. 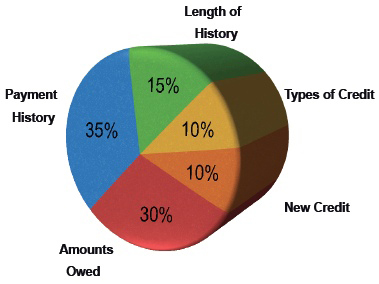 Revolving credit balance (credit cards, store accounts, etc.) is acceptable if it stays below 30%. Also watch and make sure your CC holder doesn’t drop your limit on a card thus pushing you over that percentage. Get ANY “Buy now –Pay later” type of financing, this really hits your credit report as maxed out credit account (as in %100!). Go shopping for large purchase items such as a car, truck, or fishing boat, even if not ready to buy yet. The dealer will pull your credit and that will result in an additional inquiry on your credit report. Miss or pay late ANY payments! Carefully document all deposits into your bank and investment accounts. Lenders want to know where you get additional funds once the process is started (making sure your money is legit). This includes any items you sell for a few hundred dollars to your friend or neighbor. Check with the lender if someone is offering a cash gift to help, sometimes that’s not allowed or can only be a certain amount or percentage. Keep an eye on mortgage rates. Banks are competitive and if you see a better deal at another lender, negotiate with your lender and they will probably work with you to keep your business. Keep your down payment money intact, or add to it. More available cash can sometimes help at negotiations with a seller. We’ve seen deals fall apart more than once when the buyers didn’t follow the ‘Don’ts’ from the list. You should always be smart with your credit but it’s VERY important when getting a mortgage from a lender. Ask your lender about these items and watch them nod their head (except the part about getting a better deal). If you really feel the need to spend, at least wait until the day AFTER closing! What’s In Your FICO Score? If you are planning on buying a home soon, or even a year or two from now, here are some good things to know about qualifying for a loan. This information comes from a certified trainer for “FICO Scoring 101”. With all the different kinds of information that credit scoring models incorporate, numerous tactics for improving scores are available. However, any action to improve a score must be taken judiciously: some actions aimed at improving your score may actually make it worse. Precision Credit Group can help you determine which steps will help your credit the most, without doing harm. The Derrick Team is not associated with Precision Credit Group but is providing these tips to help you get ready to buy your home. This information is not provided as professional advice. Consult with your lender if you have any questions on your FICO score and what you need to do to qualify for a loan as not all lenders follow the same guidelines. When you’re ready to buy a house, give us a call. Being represented by a Realtor costs you nothing! Even if it’s a year or two away, there are things you should consider now so you are better prepared when the time comes. We’ll discuss the basics and point you to some tools you can use to get started. Even if you are selling a current home and moving into a new one, much of this applies as well. First and foremost, work on your financing. The sooner you figure this out, the better you’ll be prepared for everything else. I would suggest working out a budget if you don’t already have one. This can help determine what you feel you can afford for a house payment. Then when you talk to a finance person you have a better understanding when they explain what a monthly payment amount covers and how much ‘home’ you can afford. (The homes costs include the mortgage, money down, and other costs for the transaction). There are also online tools such as this calculator that give you a rough idea: How Much Home Can I Afford? If you don’t already have it, it’s a good idea to check your credit report. This is a great tool that I’ve used myself and you are allowed to use it once a year for free to check all three major credit services: Annual Credit Report . They will try and sell you extra services but if you just use it to check your report it costs you nothing, (by law the credit services must supply you one free report per year). Look your reports over carefully and if you see something wrong, now it the time to fix it, before you go to secure financing for the home you saw and fell in love with (and then can’t get the financing). Next, start thinking about the type of home you’ll want and the area you think you want to move to. This is where I recommend you hook up with a REALTOR®. Find one that knows the area you’re looking at and see what they say about the availability and prices you would be looking at. Remember, when buying a home using a REALTOR®, you pay nothing for our services, (as explained in this earlier post). Of course I hope you will consider The Derrick Team as your REALTOR® of choice. Connie and I have no problem working with you long before you’re ready to make your purchase. We want to guide you in your search and even when it takes a year or two we’ll be glad to help you get started. We have the knowledge and tools of our own with which we will assist you in your search. One such tool is on our web site, the Search and Save feature located on the menu at DerrickTeam.com. It’s free to use and allows you to create searches, save and email the results to yourself or others. If you have a home to sell you definitely want to get a REALTOR® early on, so we can help you determine your homes value as it currently is, thus guiding any improvements you make to prepare your home for sale. Depending on shows like you see on HGTV could really make you waste a lot of money on things that don’t help in your neighborhood. 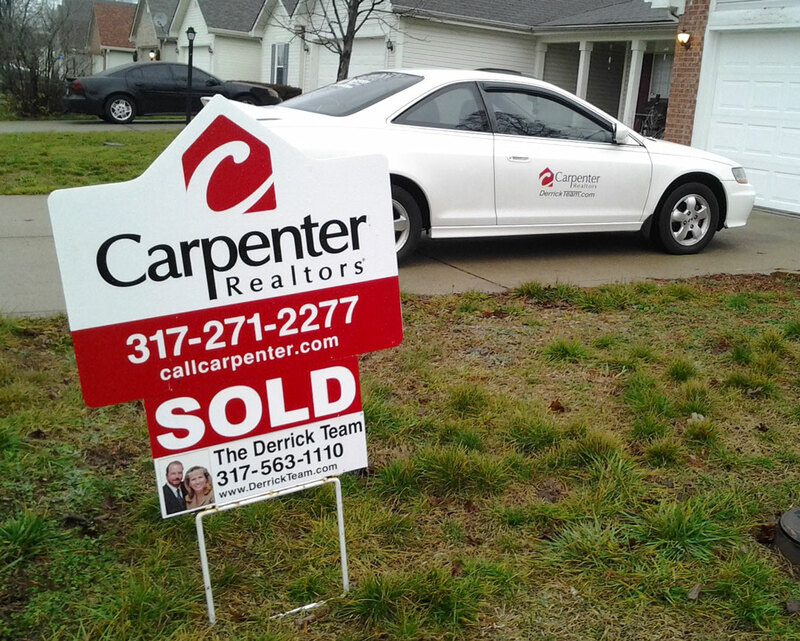 Give The Derrick Team a text or call today for any current or future Real Estate needs at 317.563.1110. We’ll be glad to talk to you about anything you’re thinking about doing now or two years from now. It’s never too early to start planning such a big purchase. And remember, we work 7 days a week, evenings too!